Perfect and low cost of fungal amylolytic and cellulolytic enzymes are prerequisite for the industrialization of plant biomass biorefinergy to biofuels. Genetic engineering of fungal strains based on regulatory network of transcriptional factors (TFs) and their targets is an efficient strategy to achieve the above described aim. Talaromyces pinophilus produces integrative amylolytic and cellulolytic enzymes; however, the regulatory mechanism associated with the expression of amylase and cellulase genes in T. pinophilus remains unclear. In this study, we screened for and identified novel TFs regulating amylase and/or cellulase gene expression in T. pinophilus 1-95 through comparative transcriptomic and genetic analyses. Comparative analysis of the transcriptomes from T. pinophilus 1-95 grown on media in the presence and absence of glucose or soluble starch as the sole carbon source screened 33 candidate TF-encoding genes that regulate amylase gene expression. Thirty of the 33 genes were successfully knocked out in the parental strain T. pinophilus ∆TpKu70, with seven of the deletion mutants firstly displaying significant changes in amylase production as compared with the parental strain. Among these, ∆TpRfx1 (TpRfx1: Talaromyces pinophilus Rfx1) showed the most significant decrease (81.5%) in amylase production, as well as a 57.7% reduction in filter paper cellulase production. Real-time quantitative reverse transcription PCR showed that TpRfx1 dynamically regulated the expression of major amylase and cellulase genes during cell growth, and in vitro electrophoretic mobility shift assay revealed that TpRfx1 bound the promoter regions of genes encoding α-amylase (TP04014/Amy13A), glucoamylase (TP09267/Amy15A), cellobiohydrolase (TP09412/cbh1), β-glucosidase (TP05820/bgl1), and endo-β-1,4-glucanase (TP08514/eg1). TpRfx1 protein containing a regulatory factor X (RFX) DNA-binding domain belongs to RFX family. We identified a novel RFX protein TpRFX1 that directly regulates the expression of amylase and cellulase genes in T. pinophilus, which provides new insights into the regulatory mechanism of fungal amylase and cellulase gene expression. The filamentous fungus Talaromyces pinophilus, formerly Penicillium pinophilum in the Penicillium subgenus Biverticillium, is a member of the family Trichocomaceae belonging to the order Eurotiales (class Eurotiomycetes; phylum Ascomycota) . T. pinophilus produces yellow colonies, darker-green conidium, and red pigment, with changes in colony color to yellow, orange, or red-to-purplish red shades on potato dextrose agar (PDA) plates . Talaromyces pinophilus has been potentially applied in the biotechnological industry due to its ability to produce integrative amylolytic and cellulolytic enzymes . Amylases, including α-amylase (EC 3.2.1.1), glucoamylase (EC 3.2.1.3), α-glucosidase (EC 3.2.1.20), and 1,4-α-glucan-branching enzyme (EC 2.4.1.18), degrade starches, with α-amylase attacking the α-1,4-glycosidic bonds of amylopectin or amylose to generate varying lengths of straight chains and branched oligosaccharides and glucoamylase breaking α-1,4- or α-1,6-glucosidic linkages at the nonreducing ends of starch chains or dextrin . Cellulases include endo-β-1,4-glucanase (EG; EC 3.2.1.4), cellobiohydrolase (CBH; EC 3.2.1.91), and β-glucosidase (BGL; EC 3.2.1.21), with EG attacking internal β-1,4-glycosidic bonds of cellulose chains to release chain ends, CBH hydrolyzing cellulose chains from both ends to release cellobiose, and BGL hydrolyzing the resulting soluble cellooligosaccharides and cellobiose products into glucose . Transcriptional expression of fungal amylase and cellulase genes is regulated by transcription factors (TFs), with the expression of both enzyme genes co-regulated under certain conditions. 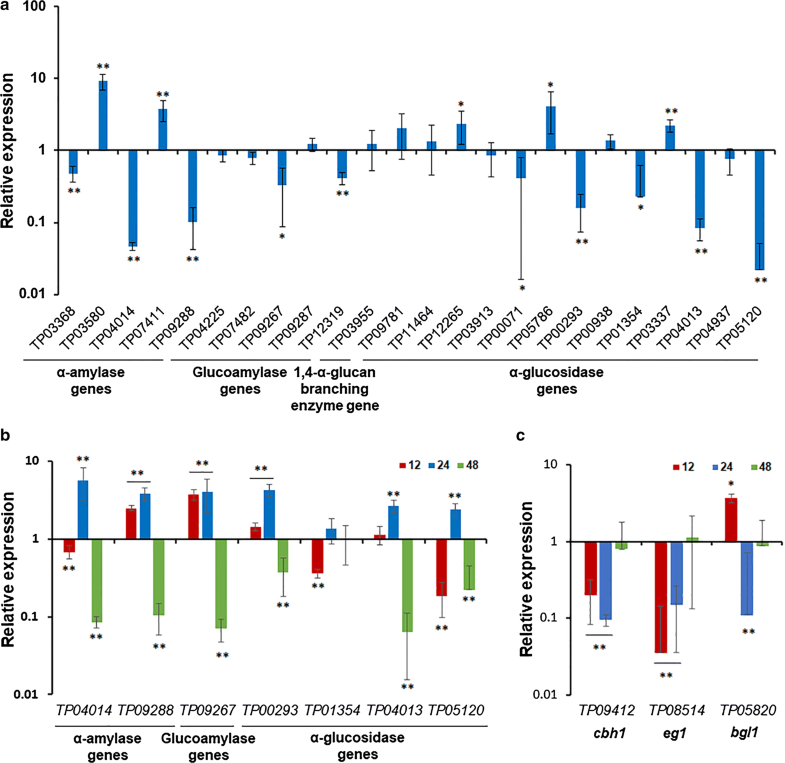 A lack of the TF AmyR induces the expression of cellulase genes and represses the transcription of amylase genes in Penicillium oxalicum  and Aspergillus niger . Conversely, the high-mobility group box protein PoxHmbB positively regulates the expression of major cellulase genes and negatively controls the expression of amylase genes in P. oxalicum . Additionally, the deletion of creA/creB involved in carbon catabolite repression response to glucose not only improves α-amylase production but also enhances cellulase and xylanase activities . However, studies identifying TFs responsible for co-regulating the expression of amylase and cellulase genes are limited and insufficient to describe the regulatory mechanism(s) associated with the expression of fungal enzyme genes involved in plant biomass degradation. Regulatory factor X (RFX) family proteins regulate both cellular differentiation and the cell cycle  and contain an RFX DNA-binding domain belonging to the winged-helix subfamily of helix-turn-helix proteins . Since the identification of RFX1 in mammals, several conserved members from yeast to humans, as well as filamentous fungi, have been isolated [10, 12, 13], including RTX1-7 in humans , Snf1-activating kinase 1 (Sak1) in Schizosaccharomyces pombe , cephalosporin C regulator 1 (CPCR1) in Acremonium chrysogenum , RfxA in Talaromyces marneffei (formerly Penicillium marneffei) , and PcRFX1 in Penicillium rubens (formerly Penicillium chrysogenum) . Among these, RTX1-7 is critical for the development of serious human diseases , and Sak1 promotes mitotic exit mediated by cAMP-dependent protein kinase . Moreover, RfxA in T. marneffei controls mycelial growth and morphogenesis by regulating cell-division events , and PcRFX1 regulates the expression of β-lactam-biosynthesis genes . However, the regulation of RFX proteins in plant biomass-degrading enzyme production in filamentous fungi, including Talaromyces spp., remains unknown. Talaromyces pinophilus 1-95 isolated from ploughed soil in China can produce highly active calcium-independent amylase and integrative cellulase , both potentially applicable to plant biomass biorefining. Recently, the T. pinophilus 1-95 genome was sequenced . In the current study, we screened and identified novel TFs that regulate the expression of amylase and cellulase genes in T. pinophilus through comparative transcriptome profiling and genetic analyses. Here, we describe a key regulatory gene, TpRfx1 (Talaromyces pinophilus Rfx1, TP06218), encoding an RFX protein that directly regulates the expression of amylase and cellulase genes. To screen candidate genes that regulate amylase production in T. pinophilus 1-95, we preformed comparative analyses of transcriptomes from strain 1-95 grown in media in the presence and absence of glucose or soluble starch as the sole carbon source. The results identified 33 candidate genes exhibiting expression levels higher than that of creA in strain 1-95 with glucose relative to strain 1-95 in the absence of a carbon source or amyR in strain 1-95 with starch relative to strain 1-95 with glucose or in the absence of a carbon source (Additional file 1: Table S1). The 33 candidate genes were then subjected to knockout experiments following homologous recombination in the parental strain derived from the wild-type 1-95 strain through deletion of TpKu70, which is involved in non-homologous end joining . Ultimately, 30 deletion mutants were successfully constructed and validated with PCR (Additional file 2: Figure S1A–W) using specific primers (Additional file 3: Table S2), with a targeting rate of 91%. 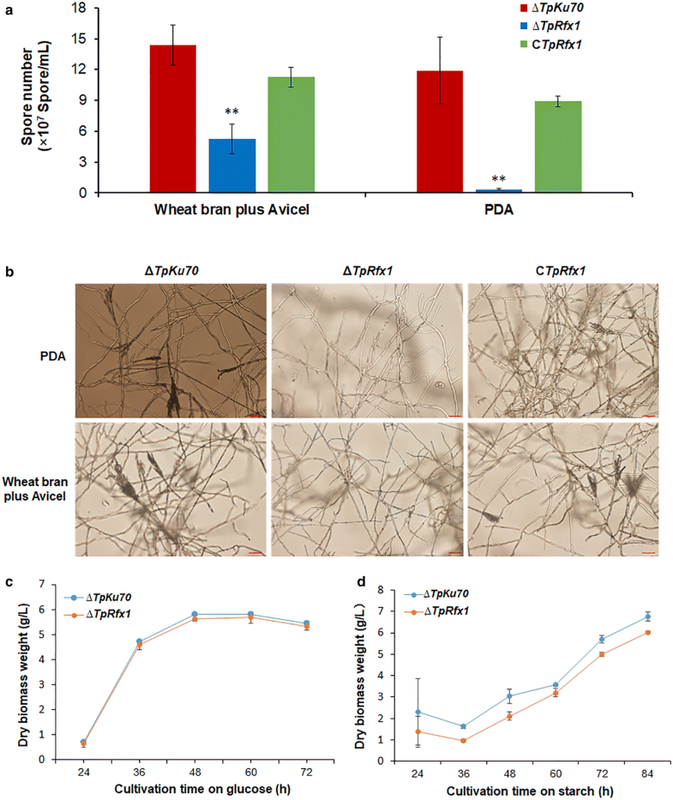 Measurement of amylase production revealed that eight of the deletion mutants, including the known ∆TpAmyR, showed significant changes in amylase production (P < 0.05, Student t test) ranging from 18.5 to 151.4% of amylase production of ∆TpKu70 (Fig. 1). Of the genes deleted in these eight mutants, seven genes (TP05746, TP05940, TP06128, TP06213, TP06945, TP08615, and TP09505) were here firstly reported to be involved in amylase production in T. pinophilus (Table 1). Interestingly, ∆TP06128 showed the 75.4% to 84.5% decrease in amylase activity as compared with ∆TpKu70 when grown in the presence of soluble starch, suggesting TP06128 as the most important regulatory gene among the seven genes. Therefore, the gene TP06128 was chosen for further investigation. To exclude the possibility of gene insertion at multiple sites in the ∆TpKu70 genome by the TP06128-knockout cassette, Southern hybridization analysis was performed using specific probes (Additional file 3: Table S2) to ensure accurate products (Additional file 2: Fig. S1X). A complementary strain harboring TP06128 was subsequently constructed and confirmed with PCR using specific primers (Additional file 4: Figure S2 and Additional file 3: Table S2). The TP06128-encoded protein comprises 861 amino acids, with SMART analysis (http://smart.embl-heidelberg.de/) revealing the presence of an RFX DNA-binding domain (PF02257; E value, 9.1e-28) between residue positions 240–317 (Fig. 2a). Additionally, BlastP (https://blast.ncbi.nlm.nih.gov/Blast.cgi) analysis indicated that the protein TP06128 shares 92% and 27% sequence identity with RfxA from T. marneffei 2161 (ABG56532.1) and Sak1 from S. pombe 972h− (P48383), respectively. TP06128 was subsequently re-designated as TpRfx1 (Tp is the abbreviation of fungal species name Talaromyces pinophilus). Phylogenetic analysis indicated conservation of TpRfx1 (TP06128) and its homologs in filamentous fungi, and specifically in Talaromyces sp. 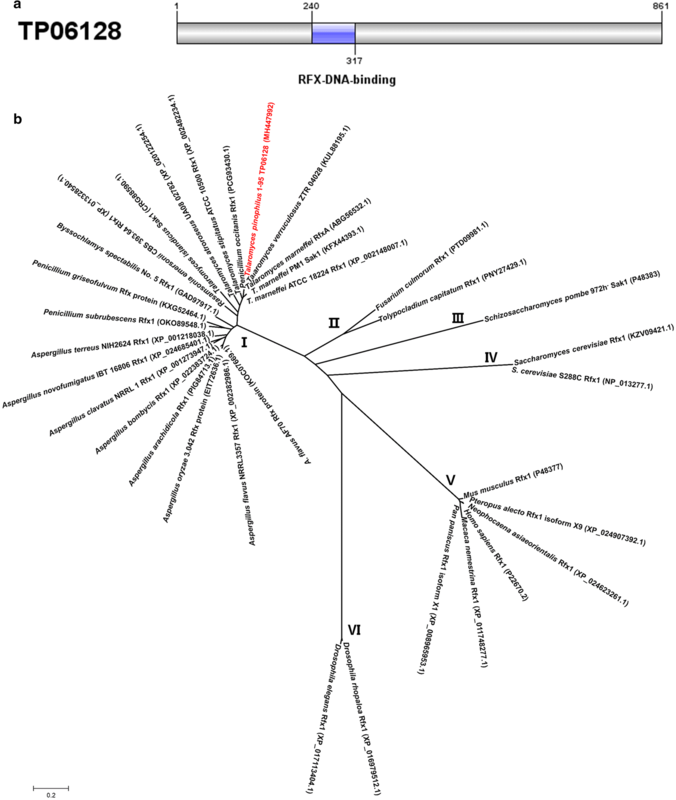 The proteins in this tree were divided into six clusters (I–VI), which included those identified in filamentous fungi (I and II), yeast (III and IV), and mammals (V and VI). RFX1 proteins from filamentous fungi were close in evolutionary relationship to those in yeast, followed by those in mammals, and more distant from those in Drosophila (Fig. 2b). 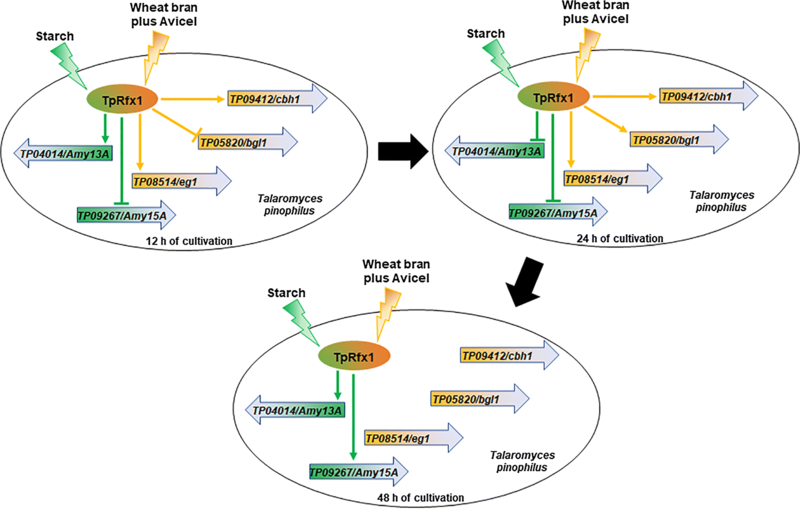 To investigate the regulatory roles of TpRfx1 in promoting plant biomass degradation by amylases and cellulases in T. pinophilus, the ∆TpRfx1 strain, complementary strain CTpRfx1, and parental strain ∆TpKu70 were transferred into fresh medium containing soluble corn starch (SCS) or wheat bran plus Avicel (WA) for a 5-day culture following a 24-h pre-culture in glucose medium, and their amylase and cellulase activities were measured. The results indicated that ∆TpRfx1 lost 77.6% to 87.3% amylase activity relative to that observed in ∆TpKu70 (P < 0.01, Student t test) under SCS induction, whereas CTpRfx1 displayed similar amylase activity as that observed in ∆TpKu70 (Fig. 3a). Evaluation of cellulase activity showed that the filter paper cellulase (FPase), carboxymethylcellulase (CMCase), p-nitrophenyl-β-cellobiosidase (pNPCase), and p-nitrophenyl-β-glucopyranosidase (pNPGase) activities of ∆TpRfx1 were reduced by 42.4% to 67.4%, 19.9% to 40.3%, 59.2% to 84.3%, and 41.7% to 69.0% (P < 0.05, Student t test), respectively, relative to the activity observed in ∆TpKu70 under WA induction. As expected, all cellulase activities in CTpRfx1 were similar to that in the parental strain (Fig. 3b–e). To evaluate the effect of TpRfx1 on T. pinophilus phenotype and growth, ∆TpRfx1, CTpRfx1, and ∆TpKu70 were incubated on solid plates containing WA as the sole carbon source, with PDA plates used as a control. Asexual spores produced by strains ∆TpRfx1, CTpRfx1, and ∆TpKu70 on plates were quantitatively analyzed. The results revealed that ∆TpRfx1 produced only 36.6% of the spores generated from ∆TpKu70 when grown on WA plates for 8 days, whereas ∆TpRfx1 barely produced spores when grown on PDA plates over the same cultivation time. Additionally, CTpRfx1 exhibited similar levels of spores on both WA and PDA plates as the ΔTpKu70 (Fig. 4a). Microscopic investigation showed that ∆TpRfx1 mycelia did not sporulate when grown on both PDA and WA plates for 80 h, whereas ∆TpKu70 and CTpRfx1 formed sporangium and produced asexual spores (Fig. 4b). To determine whether TpRfx1 affects T. pinophilus cell growth, growth curves for both ∆TpRfx1 and ∆TpKu70 were compared following inoculation into medium containing glucose or SCS as the sole carbon source. ∆TpRfx1 accumulated similar amounts of mycelial biomass as that by ∆TpKu70 (Fig. 4c) in glucose medium, whereas the mycelial biomass of ∆TpRfx1 was slightly lower than that of ∆TpKu70 in SCS medium (Fig. 4d), suggesting that lack of TpRfx1 affected the utilization of starch by T. pinophilus. To investigate whether TpRfx1 transcriptionally regulates the expression of amylase genes in T. pinophilus grown on SCS, real-time quantitative reverse transcription PCR (RT-qPCR) was employed, with ∆TpKu70 as a control under the same cultivation conditions. The transcription levels of all 24 amylase genes in T. pinophilus 1-95 , including five α-amylase genes (TP03368, TP03580, TP04014, TP07411, and TP09288), five glucoamylase genes (TP04225, TP07482, TP09267, TP09287, and TP12319), 13 α-glucosidase genes (TP09781, TP011464, TP12265, TP03913, TP00071, TP05786, TP00293, TP00938, TP01354, TP03337, TP04013, TP04937, and TP05120), and a gene encoding a 1,4-α-glucan-branching enzyme (TP03955) were measured at 48 h after shifting from glucose to SCS. The expression of each tested amylase gene in the ∆TpKu70 as the control was set to 100%. The results showed that the transcripts of 15 genes were significantly altered in ∆TpRfx1, including five upregulated by 2.2- to 9.3-fold and 10 downregulated by 52.0% to 97.8% (Fig. 5a), relative to that in the ∆TpKu70. Furthermore, seven amylase genes (TP04014, TP09288, TP09267, TP00293, TP01354, TP04013, and TP05120) exhibiting substantial reduction in expression relative to the control were selected to investigate dynamic regulation by TpRfx1. Among these, TP04014 and TP09267 were predicted to encode the key α-amylase Amy13A and glucoamylase Amy15A, respectively. Their transcription levels subsequently were measured at 12, 24, and 48 h after the shift from glucose to SCS. The results indicated that only three genes (TP04014, TP01354, and TP05120) exhibited from 31.6 to 81.4% reduced expression in ∆TpRfx1 at 12 h as compared with that in ∆TpKu70. Conversely, TP09288, TP09267, and TP00293 showed 1.4- to 3.8-fold elevations in transcript levels in ∆TpRfx1 at 12 h relative to the control. By contrast, at 24 h, all genes, except TP01354, showed upregulated expression ranging from 2.4- to 5.7-fold in ∆TpRfx1 relative to the control. The transcript levels of all genes were significantly lower in ∆TpRfx1 as compared with those in ∆TpKu70 at 48 h (Fig. 5b). Additionally, we evaluated TpRfx1 regulation of key cellulase genes, including TP09412 (cbh1), TP08514 (eg1), and TP05820 (bgl1), in T. pinophilus grown on WA and at 12, 24, and 48 h after the shift from glucose. TpRfx1 deletion resulted in significant reduction in both TP09412 and TP08514 transcripts at 12 and 24 h (P < 0.01, Student t test), whereas no changes were observed at 48 h. The expression of TP05820 in ∆TpRfx1 was increased 3.7-fold at 12 h, decreased 89.1% at 24 h, and the same as levels observed in ∆TpKu70 at 48 h (Fig. 5c). To confirm whether TpRfx1 directly or indirectly regulates targeted gene expression, in vitro binding experiments were performed using an electrophoretic mobility shift assay (EMSA). The predicted DNA-binding domain of TpRfx1 (TpRfx1190-376) was expressed in Escherichia coli, and the recombinant protein TRX-His-S-tagged TpRfx1190-376 was subsequently purified using a nickel-affinity column. The 6-FAM-tagged DNA fragments (~ 1000 bp) located in the promoter regions of the five selected target genes, including two amylase genes (TP04014 and TP09267), three cellulase genes (TP09412, TP08514, and TP05820), were PCR amplified using specific primer pairs (Additional file 3: Table S2). EMSA experiments revealed shifted bands representing TpRfx1190-376-DNA complexes in all mixtures of TpRfx1190-376 and the promoter regions of the tested genes. Moreover, we observed increase in band size along with increases in TpRfx1190-376 mass used in the gels (0.5–2.0 µg). Subsequently, we performed competitive EMSA using the same DNA fragments lacking the FAM tag, with results revealing weaker binding affinities and smaller band sizes associated with the shifted bands. As expected, no shifted bands were observed in mixtures comprising TpRfx1190-376 and the promoter region for β-tubulin gene or bovine serum albumin (BSA), the purified TRX-His-S fusion protein, and any tested target genes (Figs. 6, 7). These results suggested that TpRfx1190-376 specifically bound all five tested DNA sequences from the promoter regions of the amylase and cellulase genes in vitro. TpRfx1 regulates amylase and cellulase gene expression by directly binding to their promoter regions. To determine the targeted DNA sequence in the promoter regions, a consensus RFX-binding sequence (RTHNYYN0-3RGNAAC) identified previously [2, 18] was used to search 1-kb regions of the 5′ untranslated regions of the tested amylase genes (TP04014 and TP09267) and cellulase genes (TP05820, TP08514, and TP09412). The results identified at least one similar binding sequence (TN3DN3GNAAC) in each target gene, with the “T” nucleotide and the “GNAAC” sequence highly conserved (Fig. 8a). This putative DNA-binding sequence targeted by TpRfx1 was used to search the genome of T. pinophilus 1-95  using the MEME suite 4.12.0 (http://meme-suite.org/index.html), with results indicating that 1-kb regions of the promoters for 2169 genes contained at least one instance of this putative TpRfx1-binding sequence. Pathway classification revealed that these target genes are mainly involved in metabolism (xenobiotics biodegradation and metabolism, carbohydrate metabolism, and amino acid metabolism) and signal transduction (Fig. 8b). In this study, we screened and identified novel TFs regulating amylase and cellulase gene expression in T. pinophilus through comparative transcriptome and molecular genetic analyses. Comparative transcriptomics combined with genetic analyses are considered efficient methods for screening novel TFs, as described in the identification of the TFs RCA-1, PoxCxrA, PoxCxrB, and PoxNsdD in Neurospora crassa and P. oxalicum [19, 20]. In the present study, seven novel TFs were identified as regulating amylase production in T. pinophilus under SCS induction, with most of these containing a Zn2Cys6 domain. Furthermore, we identified TpRfx1 belonging to the RFX TF family as an essential positive regulator for amylase gene expression. RFX1 proteins are evolutionarily conservative according to their RFX DNA-binding domain and exist broadly in eukaryotes from yeast to humans. The RFX1 protein regulates the immune response in mammals and is response to infection by human hepatitis B virus, as well as cell-differentiation events in fission yeast . Recently, RFX1 proteins were identified as being involved in controlling the cell growth and morphogenesis of the filamentous fungi T. marneffei , as well as the biosynthesis of secondary catabolites, such as β-lactam, cephalosporin C, and penicillin, in P. chrysogenum and A. chrysogenum [13, 21]. In the present study, we expanded the regulatory roles of RFX1 proteins in amylase and cellulase production in the filamentous fungus T. pinophilus for the first time, suggesting diversity in the functions of conserved RFX1 proteins as regulators of gene expression. TpRfx1 regulates amylase and cellulase gene expression by directly binding to their promoter regions, which harbor at least one putative DNA-binding site specific for this TF. The putative TpRfx1 DNA-binding sequence (TN3DN3GNAAC) shares the nucleotide “T” and the five nucleotides “GNAAC” with the consensus RFX-binding sequence (RTHNYYN0-3RGNAAC) identified previously [12, 18], implying that these nucleotides are required for interactions between RFX1 TFs and their target genes. In addition to the regulatory roles of RFX proteins RFX1 and CPCR1 reported in T. marneffei and A. chrysogenum [12, 21], TpRfx1 positively regulated hyphae growth and conidiation of T. pinophilus. Moreover, TpRfx1 deletion led to reduced transcription of important amylase and cellulase genes, resulting in the decreased production of extracellular amylases or cellulases to degrade SCS or cellulose, thereby leading to impaired cell differentiation and conidiation. Talaromyces pinophilus strain 1-95 secretes extracellular enzymes in a carbon source-dependent manner. For example, high-yield amylase production, but not cellulase production, is observed in the presence of SCS medium (data not shown). Here, we found that TpRfx1 regulated the expression of different genes encoding plant biomass-degrading enzymes, such as amylases and cellulases, dependent on the type of carbon source used for induction. Our findings suggested the existence of a novel TpRfx1-mediated real-time network involved in regulating amylase and cellulase gene expression in T. pinophilus in the presence of SCS and WA, respectively (Figs. 5, 9). In the presence of SCS, TpRfx1 initiated the expression of α-amylase (TP04014/Amy13A) and inhibited glucoamylase (TP09267/Amy15A) expression during the early induction stage. Subsequently, transcription of both amylase genes was repressed by TpRfx1. During the later stage, TpRfx1 functioned as an activator to promote the expression of both genes. Interestingly, the transcription of important cellulase genes was not regulated by TpRfx1 in the presence of SCS. By contrast, in the presence of WA, the expression of both CBH (TP09412/cbh1) and EG (TP08514/eg1) was enhanced by TpRfx1, whereas BGL (TP05820/bgl1) expression was repressed at 12-h post-induction. Subsequently, at 24-h post-induction, TpRfx1 enhanced the transcription of all the three cellulase genes; however, at later stages (i.e., 48-h post-induction), TpRfx1 did not regulate the expression of these three cellulase genes. In S. pombe, the TpRfx1 homologous protein Sak1 controls cAMP-dependent protein kinase-mediated exit from the mitotic cell cycle . In P. oxalicum, the G protein-cAMP pathway positively regulates the expression of amylase genes, such as amy15A, in the presence of either starch or cellulose while negatively regulating cel7A-2 expression during early induction by controlling the expression of the AmyR . Recently, Zhang et al. reported that TpAmyR (TP09286) positively regulates important amylase genes in T. pinophilus, which agrees with the regulatory roles reported for AmyR in other filamentous fungi, such as P. oxalicum  and Aspergillus sp. .
Additionally, another TpRfx1 homologous protein, Crt1, can bind regions of DNA-damage-response genes, including RNR2-4 and HUG1, to recruit the chromatin-repression complex SSN6-TUP1 and histone deacetylases to maintain these genes in a repressed state during methyl methanesulfonate induction of Saccharomyces cerevisiae [24, 25]. Conversely, Crt1 also facilitates the recruitment of the chromatin-remodeling complexes SWI/SNF and TFIID to promote chromatin remodeling and full assembly of the preinitiation complex to activate ribonucleotide reductase gene expression [26–28]. Spt-Ada-Gcn5 acetyltransferase complex subunit-encoding genes, such as Gcn5 and Ada2, activates the transcription of cellulase genes in T. reesei and regulates mycelial growth [29, 30]. Additionally, the SWI/SNF complex subunit-encoding gene HepA (Swi6 in S. cerevisiae) is a positive regulator required for cellulase and amylase gene expression in P. oxalicum , and Snf2 expression is significantly upregulated in T. reesei strain ∆Cre1 and possibly involved in cellulase gene repression by Cre1 . However, these regulatory mechanisms in T. pinophilus remained unclear. To augment our findings, additional investigation is necessary to elucidate the regulatory mechanisms associated with TpRfx1 regarding its mediation of cellulase and amylase gene expression in T. pinophilus under starvation conditions. Altogether, in this study, we expanded the novel regulatory roles of the RFX proteins in the regulation of genes encoding plant biomass-degrading enzymes including amylase and cellulase in T. pinophilus for the first time, which provides a novel insight into deeply understanding of molecular regulatory mechanism of the expression of functional enzyme genes at transcriptional level in fungi and a potential target for genetic engineering processes. Fungal strains used in this study included the parental strain ∆TpKu70, the deletion mutants for the 30 candidate genes (Additional file 1: Table S1), and the complementary strain CTpRfx1. Fungal strains were maintained on PDA plates at 4 °C. For sporulation and mycelial growth (for DNA extraction), PDA medium and liquid complete medium [(g/L) d-glucose 10, peptone 2, yeast extract 1, acid-hydrolyzed casein 1, and 50 mL 20× nitrate-containing NaNO3 120, KCl 10.4, MgSO4·7H2O 10.4, KH2PO4 30.4 (pH 6.5)] were inoculated and subsequently incubated at 28 °C for 6 days . For enzymatic activity measurement and RT-qPCR analyses, approximately 1 × 108 fresh spores were pre-grown in 100 mL glucose medium at 28 °C for 24 h. Certain amounts of mycelia were harvested, transferred into standard liquid medium (SLM) [(g/L) tryptone 5, KH2PO4 3, (NH4)2SO4 2.5, MgSO4·7H2O 0.2, CaCl2 0.13, and FeSO4 0.0255] containing 1% (w/v) SCS (Sigma-Aldrich, St. Louis, MO, USA) or 1% (w/v) wheat bran plus 1% (w/v) Avicel (Sigma-Aldrich) and incubated at 28 °C for 2–4 days. For mycelial-biomass determination, SLM containing 1% (w/v) d-glucose was used and cultivated at 28 °C for 84 h. For phenotypic analyses, solid SLM containing 1% (w/v) SCS was cultivated at 28 °C for 8 days, with PDA used as a control. E. coli Trans1-T1 and DE3 were used as cloning and expression hosts, respectively, and cultured at 37 °C in Luria–Bertani medium. Total fungal DNA and RNA were extracted from mycelia harvested from PDA plates or liquid media, as previously described . Briefly, harvested mycelia were ground into flour in liquid nitrogen and lysed using lysate reagent [20 mM sodium acetate trihydrate, 40 mM Tris–HCl, 10 mM ethylenediaminetetraacetic acid, and 1% sodium dodecyl sulfate (pH 8.0)]. Total DNA was separated from the lysed suspension after removing protein with phenol–chloroform and isopropanol precipitation. Additionally, a TRIzol RNA kit (Life Technologies, Carlsbad, CA, USA) was used to extract total RNA according to manufacturer instructions. Deletion cassettes were constructed using double-joint PCR, as described previously . Each deletion cassette contained ~ 2 kb of the 5′- and 3′-flanking regions of the target gene and 2.8 kb of the benomyl-resistance gene (benA) and was amplified using corresponding primer pairs (Additional file 3: Table S2). The amplified product was introduced into ∆TpKu70 protoplasts  and transformants were confirmed by PCR or Southern hybridization analysis using specific primers (Additional file 3: Table S2). 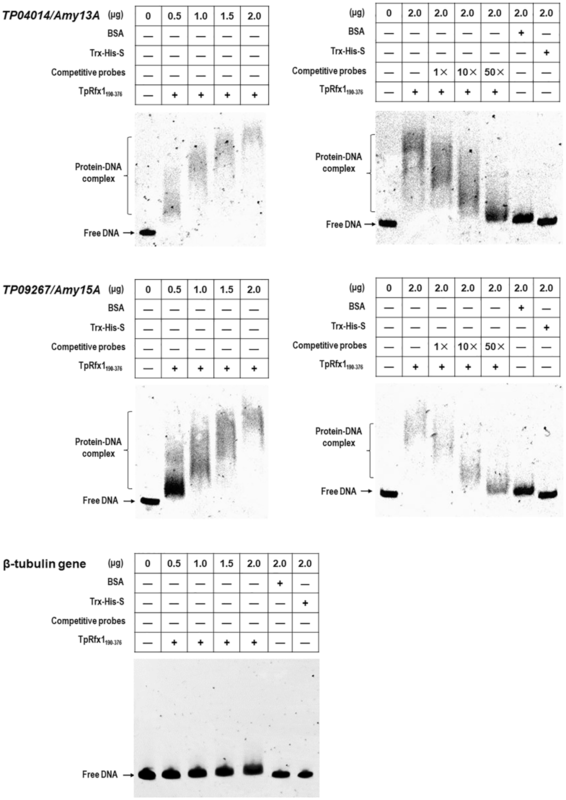 Complementation of ∆TpRfx1 was performed according to previously described methods . Briefly, a gene-complementary cassette was constructed through fusion PCR and comprised the upstream and downstream DNA sequences of TpRfx1, the predicted termination sequence of TP06064, and the bleomycin-resistance gene (ble), all of which were PCR amplified using corresponding primer pairs (Additional file 3: Table S2 and Additional file 4: Fig. S2). The resulting cassette was introduced into ∆TpRfx1 protoplasts, and complementary strains were confirmed with PCR using specific primer pairs (Additional file 3: Table S2). The ∆TpRfx1 strain was confirmed with Southern hybridization analysis according to previously described methods . The genomic DNA of the ∆TpRfx1 strain was extracted and digested with SacI (TaKaRa Bio Inc., Dalian, China), and the generated DNA fragments were separated on 0.8% agarose gels, followed by transfer to a Hybond-N+ nylon membrane (GE Healthcare Ltd., Little Chalfont, UK). DIG-high detection starter kit (Life Technologies) was used to investigate the hybridized bands using a DIG-high-labeled DNA probe amplified using the primers indicated in Additional file 3: Table S2. Amylase and cellulase (FPase, CMCase, xylanase, pNPCase, and pNPGase) activities were determined as previously described [17, 33]. Briefly, suitably diluted crude enzyme solution was added to 0.1 M citrate–phosphate buffer (pH 5.0) containing 1% of different substrates, including SCS, filter paper, carboxymethyl cellulose, and xylan, and incubated at 55 °C for 30 min and 50 °C for 60, 30 and 10 min, respectively. The generated reducing sugars were determined using 3,5-dinitrosalicylic acid method  at 540 nm. One unit of enzymatic activity (U) was defined as the amount of enzyme required to produce 1 µmol of reducing sugar per min from the reaction substrates. In addition, p-nitrophenyl-β-d-cellobioside (pNPC) and p-nitrophenol-α-d-glucopyranoside (pNPG) were used as the substrates for measurement of pNPCase and pNPGase activities, respectively. A 140 µL mixture containing 14 µL of 25 mM pNPC or pNPG solution, 116 µL of citrate buffer (100 mM, pH 5.0), and 10 µL of diluted crude cellulase was incubated at 50 °C for 15 min, and then 70 µL of sodium carbonate (0.4 M) was added into the mixture to stop the reaction. The produced p-nitrophenol was measured at 410 nm, and 1 U of enzymatic activity (U) was defined as the amount of enzyme that produced 1 µmol of p-nitrophenol per min from the appropriate substrate. Triplicate independent experiments were performed for each sample. Determination of intracellular protein concentration in fungal mycelia was conducted according to previously described methods . The collected mycelia were milled in liquid nitrogen and added to protein extract buffer. Protein concentration was measured based on the Bradford method. Fresh spore suspensions at concentrations of 1.0 × 108 spores/mL were inoculated into 100 mL of glucose or starch liquid medium, respectively, and cultivated at 28 °C for 24 h to 84 h. The hypha was collected by vacuum suction filter and then dried at 50 °C to a constant weight. The PrimeScript RT reagent kit (TaKaRa) was used for RT-qPCR analysis according to manufacturer instructions. Each PCR was performed in a final volume of 20 µL, including 10 μL of SYBR Premix ExTaq II, 0.8 μL of 10 μM forward primer, 0.8 μL of 10 μM reverse primer, 2.0 μL of cDNA, and 6.4 μL of sterile water. Reaction procedures were as follows: initial denaturation for 2 min at 95 °C, followed by 40 cycles of 10 s at 95 °C and 30 s at 61 °C. The fluorescence signal was measured at the end of each extension step at 80 °C. Relative expression levels of the tested genes were calculated according to previously described methods . The DNA sequence encoding the putative DNA-binding domain TpRfx1190-376 was amplified with PCR using the primer pairs TP06128-domain-F and TP06128-domain-R (Additional file 3: Table S2). The DNA fragment was digested by NotI and HindIII and cloned into vector pET32a(+) digested with the same restriction endonucleases. 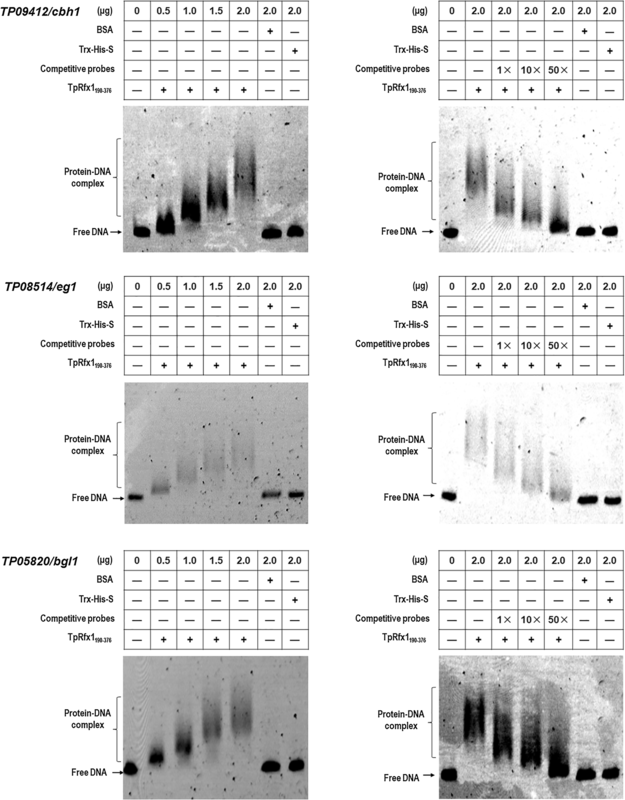 The generated pET32a-TpRfx1190-376 was introduced into E. coli Trans-DE3 cells and after isopropyl-β-d-thiogalactopyranoside induction, the recombinant proteins fused with TRX, His, and S tags were purified using TALON metal-affinity resin (Clontech, Palo Alto, CA, USA). The strain containing the empty vector pET32a(+) was cultivated as a control. EMSA was performed as previously described . Briefly, approximately 1-kb DNA fragments from the promoter regions of the tested genes were used as probes following amplification by PCR using specific primers (Additional file 3: Table S2). FAM-tagged EMSA probes were mixed with various amounts (0–2.0 μg) of TpRfx1190-367 in binding buffer [0.1 mg/mL BSA, 20 mM Tris–HCl (pH 8.0), 5% glycerol, 50 mM KCl, 1 mM DTT, and 2 μg sheared salmon sperm DNA] and incubated for 20 min. Polyacrylamide Tris–acetic acid–EDTA gel electrophoresis and the Bio-Rad ChemiDoc MP imaging system (Bio-Rad Laboratories, Hercules, CA, USA) were used for the separation and detection of protein–DNA complexes, respectively. EMSA probes without FAM labels were used for competitive EMSA. BSA alone and TRX-His-S from E. coli cells transformed with the empty vector pET-32a(+) were used as controls. TpRfx1 and its homologous proteins were phylogenetically analyzed using MEGA 7.0 software . A phylogenetic tree was constructed based on the neighbor-joining method and a Poisson correction model. In this process, the bootstrap values were calculated when 1000 replicates were established. All experimental data involving enzyme production and gene transcription were statistically analyzed using Microsoft Excel (Office 2016; Microsoft, Redmond, WA, USA). Significance analyses among samples were performed by Student t test, and a P < 0.05 was considered significant. JXF designed and supervised the research, was involved in the data analysis and the preparation of the manuscript. SZ co-supervised all the research, and was involved in the analysis of all experimental data and the preparation of the manuscript. GYL performed the construction of deletion mutants, enzymatic activity tests, RT-qPCR, EMSA and was involved in the preparation of the manuscript. TZ was involved in the construction of deletion mutants. CXL performed bioinformatic analysis. LSL, FFZ and XML were involved in the preparation of experimental materials and the analysis of experimental data. All authors read and approved the final manuscript. We thank Baoshan Chen from State Key Laboratory for Conservation and Utilization of Subtropical Agro-bioresources, Guangxi University, China for providing us with the plasmid pLPMBn containing benA gene. DNA sequences are deposited on the GenBank database (Accession Numbers MH447990-MH447996). This work was financially supported by the Guangxi BaGui Scholars Program Foundation (Grant No. 2011A001) to JXF, and the ‘One Hundred Person’ Project of Guangxi to SZ. 13068_2018_1276_MOESM1_ESM.pdf Additional file 1: Table S1. List of candidate regulatory genes for regulating amylase production of T. pinophilus. 13068_2018_1276_MOESM2_ESM.pdf Additional file 2: Figure S1. Confirmation analysis of the deletion mutants of 23 candidate genes in T. pinophilus mutant ∆TpKu70 as the parental strain. A–W. PCR confirmation analysis of (A) ∆TP00297, (B) ∆TP02310, (C) ∆TP02980, (D) ∆TP03450, (E) ∆TP03988, (F) ∆TP05236, (G) ∆TP05746, (H) ∆TP05940, (I) ∆TP06128, (J) ∆TP06213, (K) ∆TP06945, (L) ∆TP06973, (M) ∆TP07409, (N) ∆TP08445, (O) ∆TP08615, (P) ∆TP08885, (Q) ∆TP09107, (R) ∆TP09505, (S) ∆TP09510, (T) ∆TP09544, (U) ∆TP09568, (V) ∆TP095904, (W) ∆TP12095. Line M: 1-kb DNA marker, Lanes 1–3: three transformants constructed for each candidate gene, Lane 4: ∆PoxKu70, Lane 5: ddH2O. The PCR products for each deletion mutant included the production of each target gene (Top), the production of the fragment on the left of the target gene (Middle) and the production of the fragment on the right of the target gene. X. Southern hybridization confirmation of the mutant ∆TP06128. The probe was amplified from the 5′-flanking sequence of TP06128. Lane M: 1-kb DNA marker, Lane 1: genomic DNA from ∆PoxKu70 as the control, Lanes 2–4, genomic DNA from three transformants of ∆TP06128. 13068_2018_1276_MOESM3_ESM.pdf Additional file 3: Table S2. The primers used in this study. 13068_2018_1276_MOESM4_ESM.pdf Additional file 4: Figure S2. Complementation of the mutant ∆TP06128. A. TP06128 complementary DNA cassette integrated into genome of ∆TP06128 through homologous recombination. B–D. PCR confirmation of the complementary strain. PCR products were amplified with specific primer pairs TP06128-V-F/TP06128-V-R (B), CTP06128-L-F/TP06064ter-R (C) and TP06064ter-F/CTP06128-R-R (D), respectively. Lane M: 1-kb DNA marker, Lanes 1–3: genomic DNA from three transformants of complementary strain, Lane +: genomic DNA from the ∆TpKu70 as the positive control, and Lane −: genomic DNA from the ∆TP06128 as the negative control.